Dumbo Moving and Storage will be closed from September 22, 2015 on 5:00PM till September 24, 2015 on 8:00AM. Fill out the information about your move and we will instantly provide you with your moving quote as well as estimates for alternative dates. Boerum Hill is a small, upscale neighborhood in Brooklyn. The place was once known for a high crime rate, but during the last few years it has been transformed into a pleasant and family-friendly neighborhood. 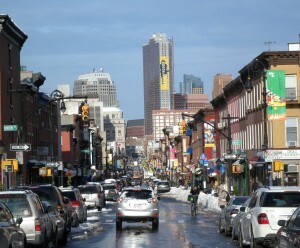 Boerum Hill is situated close to Park Slope and downtown Brooklyn. Boerum Hill is mostly quiet and residential area, with the exception of Atlantic Avenue, where most of the actions take place and Smith Street where the best restaurants are based. The neighborhood is family-oriented, the residents are very friendly and welcoming towards newcomers. Being seek and tired of Manhattan constant rush, you can find a peaceful oasis and enjoy some peace and quiet in Boerum Hill. Picturesque and tree-lined streets, good subway connections with each part of the city and excellent shopping options make this area very attractive for those who are moving to the area. Real estate possibilities are not so diverse and include mostly traditional brownstones along with some condos, upscale town houses, co-ops, and apartment complexes. Real estate prices vary depending on the part of the area. As you are approaching Gowanus, prices seem to decrease. Being one of the most popular and leading Brooklyn NYC movers, Dumbo moving and storage perform a lot of local moves in the area. They know the streets and buildings in the borough very well, which make Dumbo movers a perfect choice for you in terms of professional moving services. Affordable movers offering high quality services could be a winning combination whether you are performing a local or an interstate move. The key to successful move is reputable moving company and good organization, and with Dumbo you will have it all.